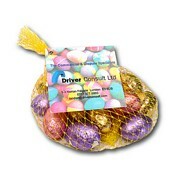 Chocolate Branded Mini Eggs Business Gift in a net is a sure way to bring your brand name to fame during Easter! With the laminated swing ticket exposing your Company's brand name and logo - customers will not only gain retention of your branding, but will have it on the tip of their tongue! With 50g of chocolate in the form of 10 foil wrapped eggs, their is more than enough to spread the joy of Easter and will suit both parents and children! For a FREE QUOTE, please fill in the form regarding our Chocolate Branded Mini Eggs Business Gift and we'll be able to help you.